The Cleanship Solutions Academy answers the big compliance unknown - training. Developed by a team of respected marine environmental compliance experts, the Cleanship Academy provides a range of capabilities and e-learning courses to help make achieving and maintaining compliance as straight forward as possible. Coming soon - a range of Virtual Reality (VR) ready comprehensive and certified manufacturer training courses covering operation & maintenance. All of our e-learning courses are fully Cleanship certified, with some also IMarEST CPD certified - ensuring all students can achieve trusted certification. 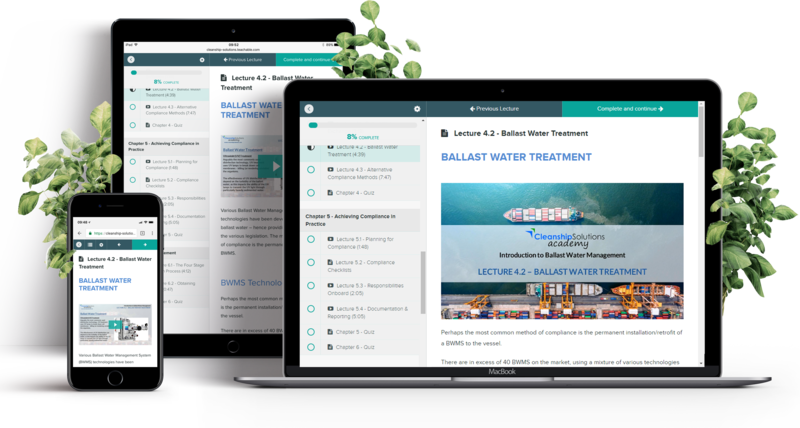 Including "Introduction to Ballast Water Management" - the industry's premier introductory course. Enroll now for FREE! With our fantastic e-learning platform. The Cleanship Academy has been developed by a team of respected industry experts. Stuart is a qualified naval architect and considered an industry expert on ship recycling and production of Inventories of Hazardous Materials (IHM) – something most vessels will require to have in place by end of 2020, thanks to the EU’s Ship Recycling Regulation. Chris McMenemy is Managing Director of Cleanship Solutions, part of Malin Group.Chris has been involved in ballast water management since 2009 and is considered an industry expert. Much of Chris's expertise is focused on the practical implementation of the IMO BWM Convention and USCG Final Rule requirements to existing vessels - including retrofitting. Vasilis Potidis is Technical Manager of Cleanship Solutions retrofit specialist & engineering team.Vasilis is a fully qualified Naval Architect with experience in ship management prior to joining Cleanship Solutions in 2016. Vasilis has been involved in numerous ballast water management, exhaust gas scrubber and energy efficiency product retrofit projects across a vast range of vessel sizes and types.